Margaret Thatcher's environmental record: She was a climate hawk. The Iron Lady had a green thumb—and a surprisingly green philosophy. 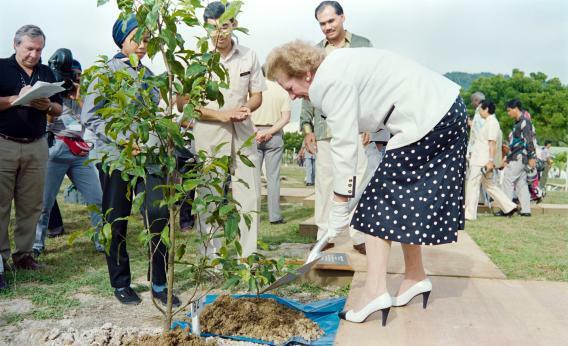 Here shovels the earth during a tree-planting ceremony on Oct. 21, 1989 in Langkawi, Malaysia. Thatcherites like to remember their heroine as a free-market absolutist. What most forget is how strongly she insisted that economic development not come at the cost of environmental destruction. A chemistry major at Oxford, Thatcher was never one of those conservatives who saw science as the enemy of progress. And in the last three years of her premiership, she became one of the first world leaders to call for action of global warming. Below are excerpts from four of her most stirring speeches on the subject. It’s we conservatives who are not merely friends of the Earth—we are its guardians and trustees for generations to come. (Clapping.) The core of Tory philosophy and for the case for protecting the environment are the same. No generation has a freehold on this earth. All we have is a life tenancy—with a full repairing lease. This Government intends to meet the terms of that lease in full. The danger of global warming is as yet unseen, but real enough for us to make changes and sacrifices, so that we do not live at the expense of future generations. Our ability to come together to stop or limit damage to the world’s environment will be perhaps the greatest test of how far we can act as a world community. No-one should under-estimate the imagination that will be required, nor the scientific effort, nor the unprecedented co-operation we shall have to show. We shall need statesmanship of a rare order. It’s because we know that, that we are here today. But the need for more research should not be an excuse for delaying much needed action now. Nor was she all talk. Thatcher backed the 1988 establishment of the U.N. Intergovernmental Panel on Climate Change, which went on to lay the groundwork for the Kyoto Protocol. And she was instrumental in the 1990 founding of the Britain’s renowned climate research center, the Met Office Hadley Centre for Climate Change. Long after her premiership, Thatcher veered toward a more reactionary stance. In her last book, published in 2003, she decried “costly and economically damaging” schemes to limit carbon emissions and lamented that climate change “provides a marvelous excuse for worldwide, supra-national socialism.” Some cynics have also noted that her early embrace of climate science dovetailed conveniently with her antipathy toward coal miners. Be that as it may, she never abandoned her faith in the scientific method, nor her conviction that true conservatism entailed leaving the Earth in livable condition for future generations. On the day of her death, let’s hope that message is not lost on her acolytes.